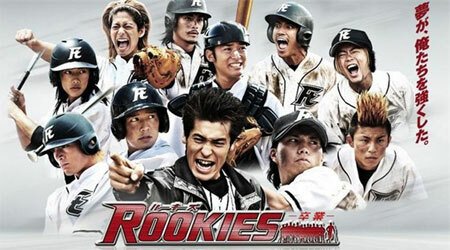 We have dreams, and they involve young men: the cast of Rookies. The Skinny: Great for fans, but only partially convincing for the uninitiated. Rookies should please anyone who enjoyed the original TV drama - so if you're one of them, get happy. If you're not, then mileage will most definitely vary. by Kozo: Rookies the Movie: Graduation works overtime to please, and the film's blockbuster status indicates that fans were indeed satisfied. Non-fans, however, may only be partially convinced. The sequel to a popular 2008 TV drama that was based on a popular manga, Rookies continues the story of the Futakotamagawa High baseball team, a group of thuggish delinquents who were once suspended for getting into a massive on-field brawl. However, as related in the TV drama, the team learned to trust their new coach Koichi Kawato (Ryuta Sato of Gachi Boy) and resolved to make it all the way to Koshien Stadium, the home of Japan's yearly high school championship. Along the way they learned about life and love, plus overacted and got all teary while talking about their dreams. Yep, just like every other J-Drama about reformed delinquents. Tough high school thugs who cry with their teachers - it's practically its own genre.